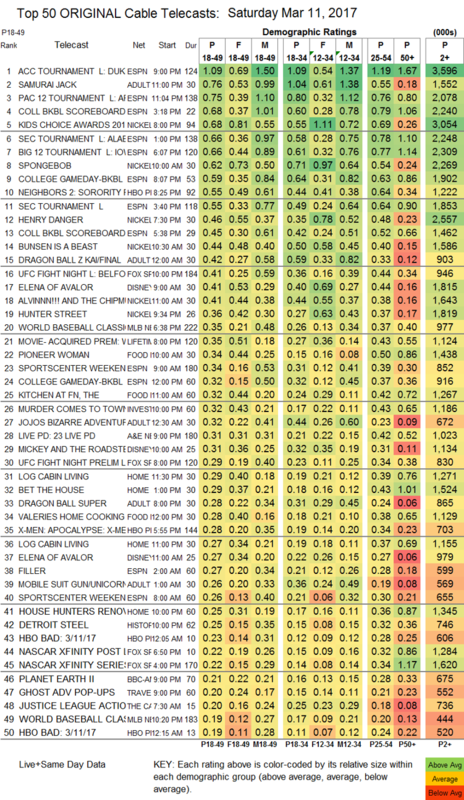 NOTE: Nielsen is slowly grinding its way back up to date, and as of late Wednesday morning PT we don’t yet have Saturday network finals, nor do we have any Saturday cable ratings beyond the Top 150 (which means that for now we don’t have the full Adult Swim line-up, among others). We’ll update as additional data comes in. CABLE HIGHLIGHTS: It was a fairly busy Saturday on cable. ESPN was crammed with COLLEGE BASKETBALL Tournaments, and 5 games (topped by Duke vs. Notre Dame in the ACC at 1.09) plus 2 editions of COLLEGE GAMEDAY appeared in the Top 15. To the extent we have Adult Swim numbers, they were Adult Swim was led by the return of SAMURAI JACK at 0.76. with the late-night DRAGON BALL Z down a tenth to 0.42 (the primetime episode was down 0.05 to 0.28), JOJO’S BIZARRE ADVENTURES down 0.11 to 0.32, MOBILE SUIT GUNDAM down 0.15 to 0.26, and HUNTER X HUNTER down a tenth to 0.26/569K; note that it appears as though NARUTO , ONE PIECE and GHOST IN THE SHELL didn’t air, or they were lost in the Nielsen confusion. The KIDS CHOICE AWARDS may have been simulcast on other Viacom networks, but for now we only have its was at 0.68 on Nickelodeon, 0.08 on Nicktoons, and 0.05/260K on TeenNick. Nickelodeon also reached the Top 10 with the 10AM SPONGEBOB, up a big 0.18 to 0.62. with BUNSEN IS A BEAST up 0.09 to 0.44 and its lead-out ALVIN & THE CHIPMUNKS at 0.41, and the primetime HENRY DANGER (which led into the Awards show) at 0.46 (plus 0.04/237K on Nicktoons and 0.05/222K on TeenNick), with Awards lead-out HUNTER STREET at 0.36 (plus 0.05/284K on Nicktoons and 0.02/121K on TeenNick). Fox Sports 1’s UFC FIGHT NIGHT was at 0.41, with the PRELIMS at 0.29. Disney Channel’s 9AM ELENA OF AVALOR was up 0.06 to 0.41. Lifetime’s movie WRONG STUDENT was at 0.35. 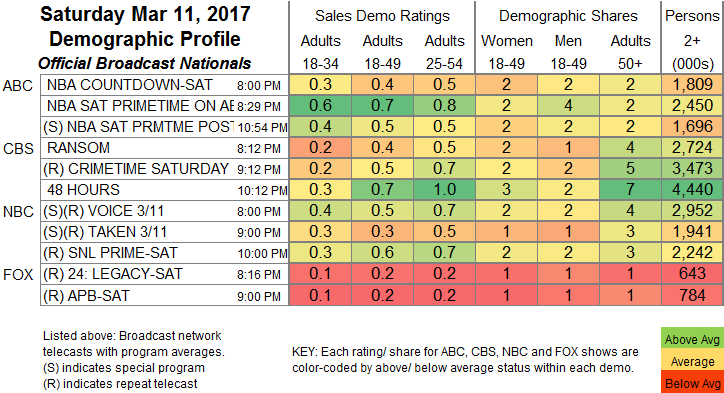 On Food Network, PIONEER WOMAN rose 0.03 to 0.34, KITCHEN AT FN gained 0.08 to 0.32, and VALERIE’S HOME COOKING was up 0.06 to 0.28. A&E’s LIVE PD ticked down to 0.31. History’s DETROIT STEEL climbed 0.05 to 0.25. BBCAmerica’s PLANET EARTH II added a tick for 0.21. On TLC, SAY YES TO THE DRESS fell 0.04 to 0.19, and the UK hour was up 0.01 to 0.16. HBO’s JERROD CARMICHAEL stand-up special was at 0.18. OWN’s LOVE THY NEIGHBOR was at 0.13/0.12.